The release continues by explaining that the Holy Father, who has followed the Church’s relationship with SSPX from the beginning, “has always tried to heal the fracture with the Society, even personally meeting Bishop Bernard Fellay,” in August 2005. “The Holy Father has been inspired in this decision by the hope of reaching the soonest possible full reconciliation and complete communion,” the statement concludes. “This gift of peace, concluding the Christmas celebrations, wishes to also be a sign for promoting the unity in charity of the Universal church and to achieve the elimination of the scandal of division,” the decree states. The decree is signed by Cardinal Giovanni Battista Re, Prefect of the Congregation of Bishops, on January 21, 2009. Vatican City, Jan 22, 2009 / 10:18 am (CNA).- Andrea Tornielli, the Vatican expert of the Italian daily “Il Giornale” announced today that Pope Benedict XVI has decided to revoke the decree of excommunication of the four bishops consecrated by French Bishop Marcel Lefebvre in 1988, creating a schism in the Catholic Church. 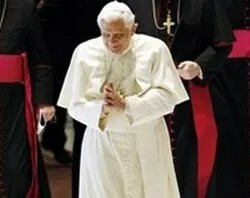 According to Tornielli, who first suggested the move on his blog on Wednesday, the decision “has been maturing in the recent months,” after Fellay sent a letter requesting Pope Benedict to revoke the act taken by Pope John Paul II following Lefebvre’s decision to ordain the bishops. “It was then a schismatic act, since those consecrations were not legitimized by the Pontiff, justified by Lefebvre as a necessity for the survival of his Traditionalist community. A community that had accepted neither the post conciliar liturgical reform nor some decrees of the Second Vatican Council, all of them signed by Lefebvre himself, including the one on religious liberty,” Tornielli writes. The two consecrating bishops–Marcel Lefebvre and the Brazilian Antonio de Castro Mayer–and the four bishops of the Fraternity of St. Pius X were all excommunicated by Pope John Paul II. Both Lefebvre and Castro Mayer are deceased.